During re-certification for the PulStar in Europe and China four new clinical studies were found. Two were Randomized Control Trials (RCTs). 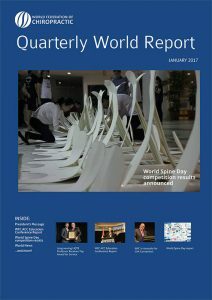 Both the Department of Surgery, Jingxi Hospital in Beijing, China, and The Medical University of Lodz, Poland, published RCT research results comparing the effects of the PulStar’s Multiple Impulse Therapy to their hospital’s standard therapy for low back pain. The additional two studies done by the First People’s Hospital at Benxi, China and the Medical University of Lodz, Poland were published, peer-reviewed clinical studies involving the PulStar. Download the studies summary to see for yourself. 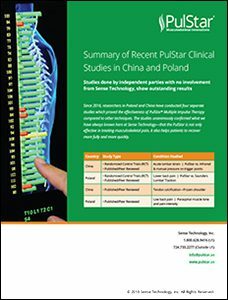 Watch as Dr. Evans discusses the recent clinical studies in China and Poland at a PulStar Seminar. –Dr. 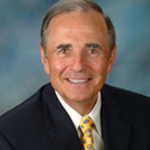 Joseph Evans, CEO Sense Technology and inventor of the PulStar. If you want to offer the most effective instrumentation for low back pain relief, you want to choose a PulStar. If you want a painless treatment for your patients with no known side effects, you want to choose a PulStar. If you want your practice to offer the fastest relief, you want to choose a PulStar. If you want to offer 21st-century care, choose a PulStar. If you want to have a clinically proven system, choose the PulStar. Did you know that lower back pain is common among astronauts in space? Chiropractors from the University of Zurich, Dr. Jaap Swanenburg and Dr. Michael Meier, decided to conduct a study to take a closer look at the problem. Their research took place on October 22, 2016, in a parabolic flight from Dübendorf, Switzerland, on a modified Airbus 310. The goal was to measure spinal stiffness in a microgravity (commonly known as “zero gravity”) environment in both standing and lying positions. They chose to use the PulStar because of its advanced analysis function, which detects any stiffness or misalignments in the spine by using computerized technology and an impulse tool to measure resistance. In order to conduct their experiment, they needed to take a PulStar G3 Mobile Suite and modify it for a microgravity situation. For example, the device had to be mounted onto a metal backpack worn by the patient. Also, they couldn’t push on impulse head with their hand, so they repeatedly inflated a balloon-like actuator that preloaded the device so that it could give the impulse. And in the end, the researchers were successful in recording a real-time muscle activity measurement and an established postural protocol, while also proving that the sophistication of analysis possible with the PulStar.